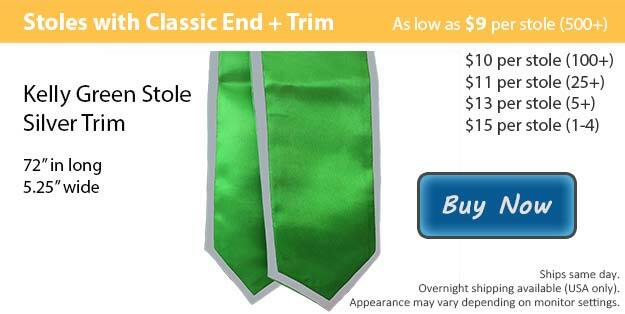 Our kelly green stole with silver trim is one great option to represent yourself. The silver is striking and does a wonderful job amplifying the beauty in the kelly green. Graduation is right around the corner and coming up fast! Here at Honors Graduation we specialize in helping graduating students prepare for their big day. We know that it can be quite a challenge to stay on track and reach your goal of graduation. That is why we have made assembling your entire wardrobe a breeze. We have all of the gear that you are searching for, from our bundled deals loaded with all the items that you need down to customizable accessories to help wrap up your outfit. You will look amazing as you join your family and friends in celebration. Many graduating students add onto the traditional attire which consists of a cap and gown for a various reasons. Members of different clubs as well as those who have earned additional achievements typically signify it using a graduation stole. Once your ceremony is finished your graduation stole will make an excellent keepsake as well. Here at Honors Graduation, when it comes to our graduation stoles we have quite a large selection. We have different options for the style, color and even the length. The two styles that you can choose from include the classic finish and the angled cut. Both options are available with or without the contrasting trim. We have eighteen terrific color choices for not only the main color of your stole but also the trim. Each stole can be a length of either 60 or 72 inches. If you wish to have your stole customized with an image or specific wording, our customization team uses embroidery to add your personal touch.